I made this card in 4 steps starting with stamping the images with Memento tuxedo black and coloring them in with Copic markers. I used a Copic friendly paper for that and placed the images with a wider space between them as usual. I also stamped them onto Inkadinkado masking paper and fuzzy cut the masks. Next I masked off the images and used a coordinating distress ink color for each of the little heroes. I wanted to create a rainbow color palette. Then I die cut them using the smaller polaroid frame of the 'polaroid fun' die set from Mama Elephant. The small images fit perfectly into the polaroid frame. 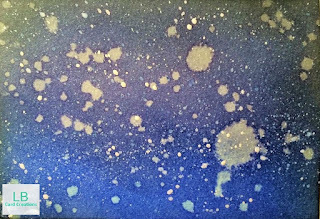 Then I prepared the background by blending the distress colors blueprint sketch, chipped sapphire and black soot together and sprinkling water droplets and white watercolor from the Gansai Tambi watercolor set. I adhered the little 'photos' to the background and die cut speech bubbles from the die set I already used. Then I stamped the greeting included in the stamp set and adhrered the speech bubbles with foam tape to my card. To finish things up I used a normal white cardbase in the same size as the background. I hope you'll have a colorful weekend and I'll see you soon. Copic Markers: B12, BG0000, C1, C3, C5, E30, E31, E34, E35, E50, E55, G12, R20, V04, V06, V09, W1, W3, W5, Y000, Y15, Y38, YG11, YG13, YR000, YR00, YR02. Such a cute and fun card the bright colours pop so nicely against the darker background. Great idea for a layout.